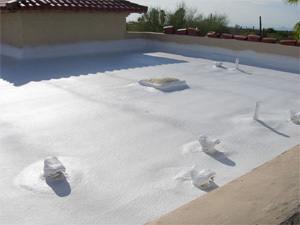 Spray Foam Roof Waterproofing helps to prevent leaks and protect your home or business from nature. Simply stated, Waterproofing is an integral facet in developing a building envelope, the barriers to weather, air, and thermal elements. But in this specific aspect of ensuring your home or building is protected from weather, or more specifically water, Waterproofing aims to protect the contents of the building or home and the structural integrity of the building as well. When Waterproofing, a coating or membranes can be applied to anything from basements to decks to roofs to ensure that structure or it’s various aspects are as close to being impermeable to the liquid form of water as possible. The waterproof membranes, thanks to new and advancing Waterproofing technology rely on incredibly adhesive, polymer-composed materials. This composition of waterproof membranes creates a seamless barrier on the structure’s outdoor surface. 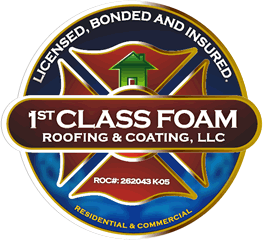 However, until 1st Class Foam completes the Waterproofing water damage can occur in your building or home which unfortunately means a variety of issues can occur. Your home or building becomes liable to anything from growing mold to compromised foundational structures or even just simply increased humidity of the building. These are just a few of the reasons out of many that make Waterproofing such an important job of 1st Class Foam. We take this aspect of home and building protection very seriously and do not settle on our job performance until the building envelope has been developed. Waterproofing can tackle everything that Polyurea Lining can. This means that the uncompromised performance from 1st Class Foam allows for waterproofing of containment linings, cracks in bridges, above and underground piping, ponds, ditches, canals, waterfalls, and of course pools. But when you make the decision to have Waterproofing done by 1st Class Foam we can also make certain that your retaining walls, basements, or really anything under ground that needs to be waterproofed so water doesn’t seep through can be accomplised by our professional teams.